This is part of a series, but the first that I have read. I plan on going back, even though I know the pairings that have happened, I am curious to know their stories too. In this book we meet new to the team, Robin, who has been brought in as the temporary team leader. She is an interesting character, as she is constantly striving to be the top, and has some issues with not knowing as much as the rest of the team, yet being a leader. I really enjoyed watching her learn and grow. It worked really well. She has an immediate and visceral connection with Mickey, a very experienced helicopter pilot and major player. He is also knocked for six by his desire and the ease with which he and Robin fall into each other’s company. Using flying terms to describe their first time together amused me a lot! I have to say that there is a lot of 'technical' flying information, which I enjoyed, and much about the practicalities of firefighting from the air. Do not let this put you off – firstly, you will definitely learn a lot, and develop a high level of regard for the bravery of these people, but also the intensity with which they work spills over into how they play, and it is scorchingly hot. I am adding this series to my read list, and look forward to catching up with the whole team, and looking forward to whose turn it is next. 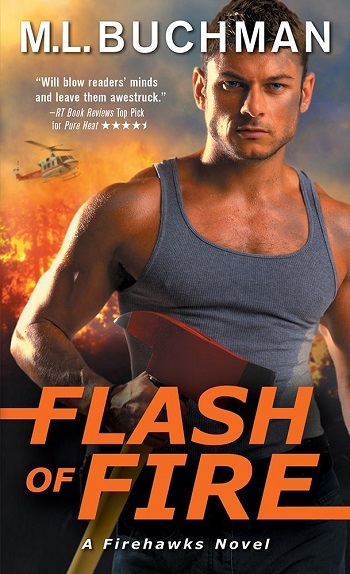 Reviewers on the Wicked Reads Review Team were provided a free copy of Flash of Fire (Firehawks #7) by M.L. Buchman to read and review.